You’ll need to become good at sourcing your own real estate clients in NYC to be able to make a living as a real estate agent in the city. The commission splits we offer are very high, but it’s important to realize that they apply to your own independently sourced and executed deals. Therefore, it’s important not to become dependent on leads and referrals generated by Mont Sky Real Estate. You must strive to independently source your own deals to make it! Your personal and professional network will be your best source for new clients. Make sure your connections are aware of your new career in real estate! If you’ve been in real estate before but just changed companies, let that be an excuse to reach out to everyone you know! Build a professional social media presence. This means a business related Facebook page (i.e. Carla Thompson – Mont Sky Real Estate), Instagram profile, Twitter profile, Tumblr blog account and more. You should invite all of your personal contacts to like or follow your business social media profiles. You should also leverage your existing personal social media accounts to promote your business. When it comes to blogging, you can certainly create your own website if you are tech savvy. However, it may be easier to simply blog via platforms like Tumblr or LinkedIn if you don’t want the hassle of also running a website. Remember to get your site approved by management! Tip: LinkedIn is a great resource especially when it comes to connecting with fellow industry professionals. You should add as many fellow agents to your network as possible so when you have a new listing to share, everyone will know about it! Professionals from related industries such as real estate attorneys, mortgage bankers and brokers, personal bankers, divorce attorneys and financial advisors are natural sources of leads for real estate agents. The key is to find a competent professional in each of these industries whom you get along with, and refer everyone you can their way. If you make an effort to consistently refer clients their way, most people will gladly return the favor! Tip: Be creative in your referral sources. Even hair dressers come across and speak with many wealthy individuals at work. Make friends with a hair dresser at a high end hair salon and leave them a stack of your business cards. If they refer you a client, make sure to treat them! When a new potential client you’ve met gets home, he or she will search for your name online. You want to make sure your online profiles (i.e. Zillow, Trulia, Facebook, etc.) are full of positive reviews and 5 star ratings. That’s why you should make it a priority to chase clients you’ve worked with before to take 5 minutes to write you and your company a kind review online. Did you just help a buyer client close on their new home? Make sure to give them a thank you letter accompanied by a stack of your business cards! Perhaps this card can accompany a thoughtful house warming gift that you personally bring over. Be creative! If your client had a great experience with you and you’ve just given them a warm closing gift, you can rest assured that they will be talking about you and handing out your business cards to their visiting friends and neighbors. There are many agents who make a living purely from online buyer leads purchased from real estate search websites such as Zillow or StreetEasy. The key to monetizing buyer leads from these sources is to immediately respond in a professional manner. You should call back leads with phone numbers within 5 minutes of receiving them. If you habitually wait a hour or even a day, the lead will be cold and you should not bother wasting your money on them in the first place. This is because few people pick up calls from unknown numbers these days, unless they’ve just asked for more information. Before spending money on purchasing buyer leads, you should have a thorough understanding of how commissions and co-broking works, have a good understanding of the real estate market and understand what closing costs are and how the closing process works. You should be able to explain to the buyer that your services are completely free and that if they are bullied into dual agency, they are simply giving the listing agent double commission! Furthermore, you need to represent to the buyer your qualifications. Perhaps you’ve gone through the purchase or sale process yourself or you live and really know the neighborhood. If you are interested in making an investment in buyer leads, please take the initiative and contact lead vendors directly! Feel free to partner up with other agents if you’d like to share the cost. Tip: Mont Sky provides its agents with an edge when it comes to converting buyer leads and pitching potential sellers. Please stop by office hours to learn more. If you simply search online for how to sell For Sale By Owner (“FSBO”) in NYC you will find a plethora of articles on why it’s very difficult for FSBO sellers to succeed. Essentially, FSBO listings are considered “off market” because they’re not receiving attention from the 90-95% of buyers who are represented by agents. This makes obvious sense because many FSBO sellers flat out don’t want to deal with agents, in which case why would a buyer’s agent risk 3% commission by introducing a FSBO listing to his or her client? Furthermore, even if a FSBO seller offered to work with buyers’ agents, or even if they wrote “will pay 3% to buyer’s agent” they are still out of luck. That’s because there’s no mechanism for the buyer’s agent to get paid and to ensure that the buyer won’t go direct to the FSBO seller. After all, the buyer can simply search for the address online to see that it’s a direct sale by the owner! 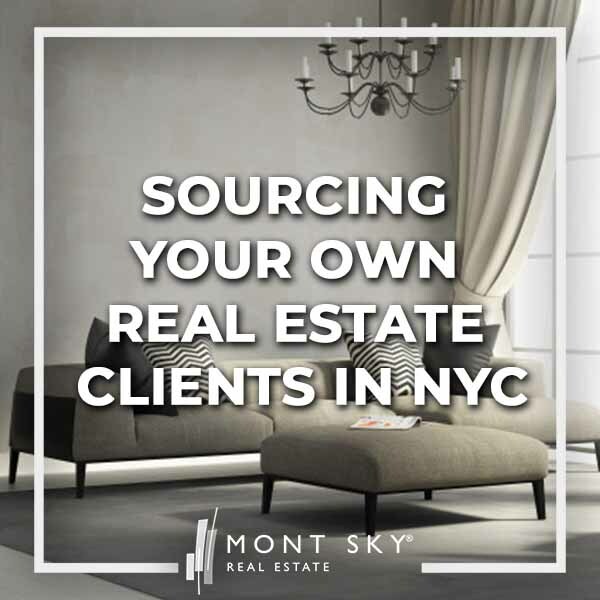 In contrast, if they listed with Mont Sky Real Estate the seller’s property would be listed in RLS (REBNY Listing Service) which is the equivalent of the Multiple Listing Service in NYC as well as 100+ real estate search websites such as StreetEasy, Zillow, Trulia and Brownstoner. We would properly co-broke and offer a commission to buyers’ agents in RLS which would ensure the cooperation of over 16,000 REBNY Member agents in the city. It’s important to point out that co-broking is automatic and contractual between fellow REBNY Member Firms. Therefore, a buyer’s agent would never hesitate to show our listing to their buyer because they sure they’ll get paid! Listings by other agents typically expire because it was priced too high or improperly marketed in some way. Since most agents in NYC will be savvy enough to order professional photos and a floorplan, it’s usually the price that’s the reason for a listing expiring without being sold. Occasionally it might be because a listing was marketed by a small “mom and pop” broker who is not a REBNY Member, in which case the seller might as well have sold For Sale BY Owner. Listing agreements are typically 6 months in length, though variations do occur based on client demands. You can search in RLS (via vendors such as Nestio, OLR, RealtyMX or RealPlus) for off market listings. RLS will tell you whether the property has been sold or if it’s just off market. Reach out to the seller and propose a new marketing plan! Explain that switching brokers is the only reliable way to reset the property’s days on market count. Do some research on comparable listings and sales in her building and neighborhood and propose a new, more realistic listing price. Note: Sometimes a listing will go in contract and then one day go off market. Be careful in these instances as the listing agent may have just taken it down per their client’s request but it is really about to close.